After touring the vineyards at Crasto, and visiting Quinta do Vale D. Maria and Quinta do Vallado, I was pretty tired as I checked into my room at the wonderful Casa do Visconde de Chanceleiros. It was already past seven, but faced with the choice of another winery visit, or a nice relaxing meal, what would you do? It's obvious -- the winery visit wins hands down. I leapt at the opportunity to visit Quinta do Infantado, and so João Roseira picked me up and drove me the short distance to the winery in Covas de Douro. Infantado has a traditional, almost run down appearance, with lots of ancient barrels, but the Ports produced here are impressive. 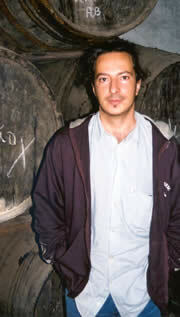 João, and his winemaker Luis Soares Duarte, also produce a range of table wines under the Bago de Touriga name, but these are not made here. João is currently hard at work developing a visitor centre at the winery so that he can offer a cellar door facility to tourists. This is still relatively rare in the Douro. 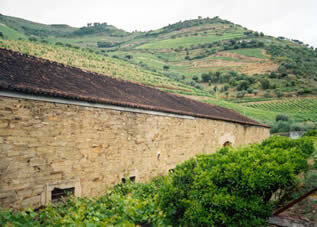 João thinks that it's important to make the full range of ports in lagares, not just the vintage. They give elegance, which he claims that tanks can never give. In lagares there's a very high ratio of skins to must, but you do need a lot of people to tread them regularly or else you don't get the advantage. 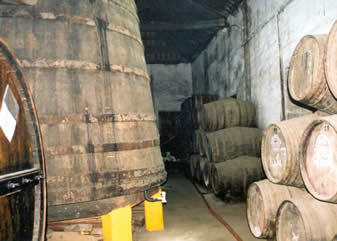 At Infantado the brandy addition is a partial process that takes place in the lagar. In the absence of any cooling, doing it bit by bit prevents the temperature rising and damaging the fruit. It also causes the yeast to work more slowly and facilitates an enhanced extraction from the skins. João very kindly invited me to his home for dinner. While he cooked, I worked my way through several wines that he had opened, taking notes of course (for a full write up of the Bago de Touriga wines, you'll have to wait for the write-up of the grand Douro tasting and dinner in Chanceleiros). 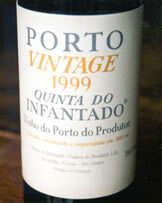 I was very impressed by the 1999 Infantado Vintage port, which recently came joint first in a blind tasting of 1999 ports put on by Portugal's leading wine magazine.